Azkals' joint: Alfredo Fernando Razón Gonzalez: A man before his time! Why and what for? As I've often stated, I'm a coattail fan, I'm a newbie, I wasn't around when Philippine soccer meant hurt, humiliation and a dream or was it hallucination? Having said that, I'm no less a fan of Philippine soccer now, than those who were here way before me. But that doesn't mean I'm not learning our past, my past. So here I am discovering a bygone hero, a man I wished I've known when he was still playing. Ridiculous as it sounds, I wish he'd put on those old football shoes of his and start playing on the pitch again. 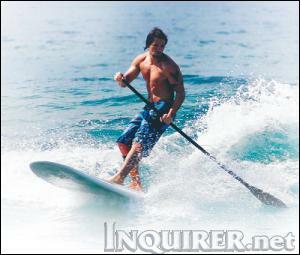 He isn't that old at 33 years old, hey if Dan Palami can do it, why can't he? I don't care if he is not the player he used to be. I'd just like to say I saw, arguably the greatest Filipino bred soccer player of his generation play on the pitch again. So I'll start with the basics. Born: In Parañaque City on Oct 1 1978. Like a large minority of 'Filipinos' he has mixed heritage. In his case, of Spanish- French descent. A hyper active kid, his mother Terry Razon(deceased) enrolled him at the tender age of 6 into the Makati Football School(MFS), his tutor was the famed football guru, Tomas Lozano, the founder of MFS. Even at this young age, he was noted to be of superior 'genetics' and excellent speed which only increased as he got older. He attended school in Colegio de San Agustin in Makati and promptly became a star. After high school, attended Univerity of San Agustin in Iloilo at the same time playing semi professional soccer. He earned a soccer scholarship to the University of Portland, staying there for 2 years(1998/99) and playing for the Portland Pilots, the school soccer team, honing his skills in the offensive side of the game, and finally graduating with an Engineering degree in Cnth. 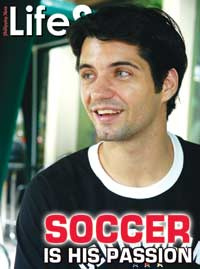 Somewhere in between all this, he played amateur soccer in France(couldn't find anymore info on clubs, etc). He received his first national team call up in 1997 for the South East Asian games and the next year played in the then, "Tiger Cup", now Suzuki Cup. By this time he was beginning to show his qualities on the pitch, most specifically his speed and propensity for scoring. "Shortly after Le Huynh Duc broke up with Bank of East Asia, leading the club was in talks with striker pillars of Philippines in Tiger Cup qualification last - Alfredo Gonzalez. The first procedure to force his team was complete. This afternoon, players will be available in HCM City to sign a contract. Nguyen Tien Huy, the new CEO Club of East Asia Bank, said in a telephone conversation yesterday, Alfredo Gonzalez has agreed to all conditions set by the Bank of East Asia offers. Secretary-General Michel Philippines Football Federation has sent an official letter Club Bank of East Asia, said Alfredo Gonzalez will be the messengers of friendship between the two countries, and this is a good opportunity to learn football Philippines Vietnam. Gonzalez said he played to Vietnam mainly to raise the level of football (the club he played for amateur Kaya, and in a transport company of the family). According to experts, Gonzalez is a player with speed, agility ability to score". Unfortunately, Freddie came at a time when they were already in decline. His first year(2003) saw them at 9th place in the V league premier division of 12 total teams finishing with a 7 win, 8 loss and 7 tie record. The following year saw the team being bought out and renamed Thép Pomina, Pomina being a Vietnamese steel mill. They finished with a record of 4 wins, 12 loss, and 6 draws, 12th and last place which also secures for them the dreaded relegation to the Vietnamese 1st division. Here the team was renamed Thép Pomina Tiền Gian, when they moved to the locality of Tien Gian. In 2005, his last year with the team, they finished with another dismal showing finishing 13th in the 13 team Vietnamese 1st division with a record of 5 wins, 11 loss and 8 draws. Unfortunately I have not found any rosters or individual stats for Freddie during his stay with the team. It is important to note that in one Philippine newspaper article dated 2009, mentions him as playing in Vietnam for only 1 year. After this season Freddy decided to concentrate more into his new found interest in Surfing and other business ventures such as bringing in the Brazilian Havaianas brand flip flops into the Philippines. With his varied interests, he opened Aloha Board sports catering to skaters and surfers alike. Google and find his online website, it's very well made and you'd think it was an American or Australian site if it wasn't for the Filipino faces. He also owns a skate shop in Taguig at the Global City called 5-O(Google this term if you are not a skater/I've heard he was selling this shop?). He has been married to Anne Arcenas- Gonzalez and she serves as partner in his various companies. Before and after his journey to Vietnam he was involved with Kaya FC. Now he is a chairman of the UFL team, Pachanga FC. Here is a news article about Freddie and his Pachanga FC team Captain. Like many other clubs, it is love for the game that has also brought the players of Pachanga FC together. And when you consider their diverse backgrounds and how they all got together you wonder if it’s lightning in a bottle. On an afternoon with a hint of rain, team captain Yves Ashime and Rodriguez go up to the Gatorade offices in Bonifacio Global City for a sponsorship meeting. Despite missing a tooth, Ashime readily flashes a warm smile. He realizes that a sponsorship here and there can mean bigger things for his team and himself. He’s learned not to take things for granted. Now he is captain for a football team in a strange land that he now calls home. The Caveat: It's not a wiki article so I didn't include citations but if you look closely you'll find what I found. I didn't add much of anything about his current doings as I wanted to focus on his International Football career, it's beginning and end. This blog is basically clips of information I found and put together so you won't have too and if you have other pertinent data I would love to add it on this blog and site you for it. Don't be afraid to comment if you've got something constructive to add. Thanks to spam and tophercap of usapangfootball.proboard.com who jump started a dead end for me, muchas gracias compas! Viet 10, who knows more about Freddie than most Filipinos! Thanks to Inquirer.net for the last photograph. The Big Guy just scored 7 goals against SGU and was invited to the Azkal camp again after more than half a decade! What do we do without you Aly?